Most of those old Scotches justify their cost because of inventory expenses and the loss over many years of much of the spirit through evaporation. This Tequila, good as it is, must deliver a huge profit margin. "Value in a spirit doesn't only come from aging," Gonzales says. "It comes from everything in the production process. We're selling Mexican craftsmanship in every way." Gonzales, a 40-year-old Mexico City native, got into Tequila at age 23, when she boarded the Ship for the World Youth, a well-meaning Japanese government-run project that puts 300 jovens from around the world on a boat for a year to try to learn each other's culture. To represent Mexico, she had to learn to dance the Jarabe Tapatio, and she had to learn something about Tequila. She went on to get a masters in marketing at Northwestern (Casa Dragones has really slick marketing materials) and did an internship at the Minnesota Star-Tribune, but was savvy enough not to go into newspapers to make money. 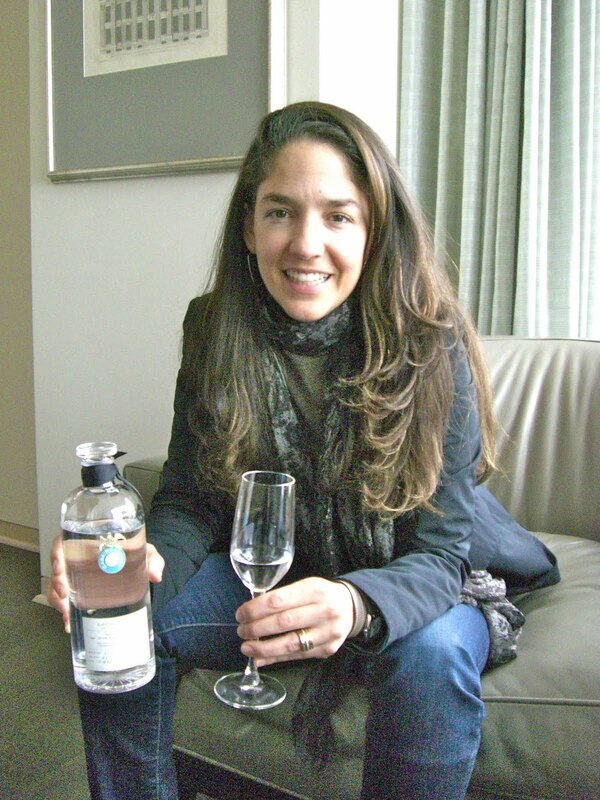 Instead, she got a job for Grupo Cuervo, managing their Tequila portfolio in the Mexican market. She worked there for 10 years and went through the testing process to become the first Maestra. "My mentor asked me, 'Why are you not a Maestro?' I said, 'Because I don't have a mustache'," she said. "I took my course and passed all my tests. It's definitely a male-dominated industry, but that didn't scare me. In some of my (work) positions, I got that look. You know that look? 'You're going to do that, and you're a girl?' You just have to work with it." She left Cuervo in 2007 to start a guide to Mexico City, Guia de Jefe. While doing that, she met Pittman and pitched her idea for the Joven Tequila. While she has the chops to taste Tequila, she doesn't have any experience making it, so she talked a Cuervo veteran named Benjamin García out of retirement. How they make it special is to cut as close to the heart of the agave as possible. They extract the juice with steam; "that gives us some of the raw notes of the agave fruit," she says. I am frankly unclear about how that differs from other premium Blanco Tequilas other than quality control -- which matters, of course; the best thing Bill Harlan does for his Harlan Estate wines (another contender in this price range) is the rigorous sorting process. And while Casa Dragones is growing its own agave with plans to produce its own 5-year-aged spirit for the blend, currently they're purchasing that portion. So maybe anybody could make a Tequila this good if they really wanted to. But it's fair to say that a Tequila this good in this style just isn't a goal for many companies. What's most interesting about Casa Dragones is the way it shifts the paradigm of expensive liquors -- youth over age, the flavors of agave over the flavors of wood, elegance over power. It's like a Burgundy of booze, instead of a blunt-force modern Bordeaux. I can't deny that the bottle price includes plenty of marketing and, to steal a phrase from auto dealers, "additional dealer profit." But I do like the qualities it values, and would like to see the premium spirits (and wine) markets value those qualities as well. If Gonzales were writing this, she would talk about the hand-engraved bottle and some other expensive parts of the packaging. I'm just all about the booze. And this is a good one. If you regularly buy spirits in this price category, it will stand out, and not just because it's pretty. The delicacy of the aroma is striking: you can put your nose all the way in the glass and it doesn't overwhelm you. There are citrus hints and a roasted note, as well as a hint of pear. On the palate, it's quite salty, with some nice orange peel notes initially and pear on the finish. The main impression you get, though, is saltiness with a very, very controlled burn. It's also unusual for a spirit in this price range in that it's probably better before a meal than after. The joven category was alive before this. See illegal joven for an example(mezcal but oh well). It may be truly stunning, but is not a resurrection of joven. Funny you should mention that, I tried the Ilegal Mezcals just a little while ago. Great name and logo. I'll stick with my term. There may be a Joven or two in Mexico, but it's a very obscure category. "Joven" has a different meaning in mezales. Joven mezcales are unaged, and would be called "blancos" or "silvers" were they tequilas. I can't speak to the quality of this tequila, as I've never tasted it, and am certainly skeptical of the price point. But it is a fact that no one else is _currently_ producing a 100% agave joven. Salud!